WELCOME to the very best location in Niagara Falls, New York. The Red Coach Inn overlooks Niagara's majestic Upper Rapids, just 500 yards from the brink of Niagara Falls - so close you can hear the roar! Modeled after the Bell Inn in Finedon, England, The Red Coach Inn has been welcoming guests to Niagara Falls since 1923. 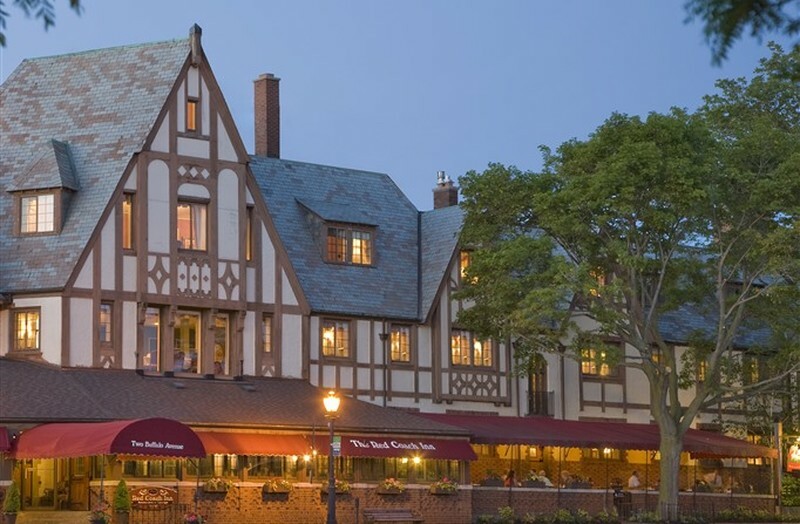 This Niagara Falls, NY hotel is the city's most distinctive historic structure, with its English Tudor exterior and warm English country ambience. Choose from our romance, dinner, or tour packages for a truly complete Niagara Falls experience. We also offer banquet facilities for business conferences, family reunions, showers, wedding receptions, and rehearsal dinners. Our accommodations offer a lodging experience far superior to a conventional hotel stay. When The Red Coach Inn, a Niagara Falls USA historic hotel and B&B, opened its doors for business on August 30, 1923, Niagara Falls had finally gained a hostelry befitting its rank as the honeymoon capital of the world. Situated near the center of town overlooking the spectacular Upper Rapids, the Inn was an imposing structure, three and one-half stories high, and built in the architectural style of the old English Tudor period. The owners, William Schoellkopf and Charles Peabody, spared no expense or effort in recreating the atmosphere and style of the Bell Inn in Finedon, England. History says the Old Bell "was granted a license during the reign of the Saxon King Harold and Queen Editha who often rested there when stag hunting." Above the fireplace in the Grill Room is a painting of General LaFayette's famous red carriage, for which the Inn is named, by Buffalo artist A. Rafael Beck. The scene depicts the greeting of LaFayette at the Eagle Tavern, which was located across the street in the early nineteenth century.